Perfect for music conductors as well as music instructors. 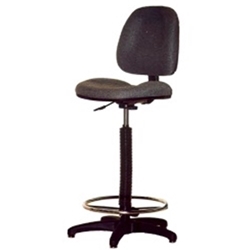 This comfortable stool features a generous 19.5" wide seat, a contoured seat and back, and a sturdy 20" diameter chrome foot ring to reduce back strain. Covered in a durable woven fabric, stool offers instant lift height adjustment with a 28" to 31" seat height range, and back depth adjustment. Suggested weight capacity: 250 lbs. **If you are needing an item expedited or by a certain date. Please call us directly at (956) 609-9306 so your order is routed accordingly.